Below we’ll talk about how to convert an image file to a PDF document. All image formats are supported: JPG, PNG, GIF, TIF, BMP and others. Unlike other recipes, we won’t be using no extra software that doesn’t come installed with the Windows 10 operating system. 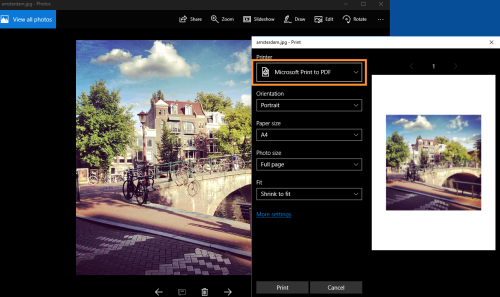 Open Windows Explorer and navigate to the folder where the image is located, then double click to open it with Windows Photos. 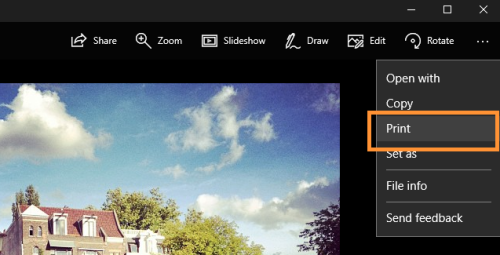 From the Windows Photos menu select Print. A Print dialog will open. Make sure the Microsoft Print to PDF printer is selected. You can configure some handy options too, like Paper size, Orientation or Photo size. Now click the Print button and choose where to save your resulting PDF document. Woop woop! You’re done, congratulations. That was easy!